4. Do Cuttlefish Dream of Electric Eels? A new article reports that some cuttlefish seem to go into a state that is similar to REM sleep. REM or “rapid eye movement” sleep is the kind of sleep humans are usually in when they dream. This is very surprising. Sleep itself is widespread in the animal kingdom, but REM sleep is a different matter. Just about all animals studied seem to have some form of sleep. This includes not just mammals and birds, but crayfish, fruit flies, nematode worms and perhaps even jellyfish. (A good survey of animal sleep is here.) There is not much consensus about why sleep is so common, from an evolutionary point of view, but it goes deep into the history of animal life. In REM sleep, the sleeper’s brain is more active and the eyes dart around. Humans cycle back and forth through REM and “deep” sleep throughout the night. For a long time it was thought that REM sleep occurs just in land mammals and birds. Some years back, sleep researcher Stephen Duntley and his colleagues reported that some species of cuttlefish seemed to have a REM-like state. Within longer periods of sleep-like inactivity, the cuttlefish would sometimes move their arms and go through color changes. But these reports were brief and never published as articles. The new study, written by Marcos Frank and his co-authors, took a closer look and found that adults of the common cuttlefish (Sepia officinalis) do seem to have different phases of sleep, and one of these phases includes arm-twitching, color changes, and the eyes moving rapidly underneath their closed lids. Teresa Iglesias, who told me about this study, is working on some follow-ups. One thing she is looking at is “how asleep” the cuttlefish are in different phases – how they respond to stimuli when in these states. I don’t know if these ones are asleep, but here are some cuttlefish taking things pretty easy. These photos also introduce two other species, much smaller than the Giant Cuttlefish, both with very good names. The one on the left is Sepia plangon, the Mourning Cuttlefish, and the one on the right is Sepia mestus, the Reaper Cuttlefish. REM sleep in cuttlefish would be a remarkable case of convergent evolution, where a similar trait arises independently in several evolutionary lineages. Back in the first post I started sketching the evolutionary relationships between ourselves and cephalopods. Any two organisms on earth have a most recent common ancestor. The most recent common ancestor of ourselves and cuttlefish lived something like 600 million years ago (a very provisional estimate). This ancestor of ours was probably a small flattened worm, living in the sea. It’s not out of the question that this animal had a cycle of waking and sleeping, but it is extremely unlikely that it had REM sleep. (For a start, it probably had only the most rudimentary eyes – remember we are talking about a flatworm here.) Whatever psychological similarities there are between ourselves and cephalopods are the result of evolution taking similar steps on separate lineages leading away from this common ancestor. REM sleep, you might think, is the last place you’d expect a commonality between mammalian and molluscan brains. Why should evolution have produced this distinctive kind of sleep twice over? Well, why would evolution have produced it once over? Why do we have REM sleep? The question is tantalizing because of the connection between REM sleep and dreaming. Roughly speaking, REM sleep in humans is dream-filled sleep, and other kinds of sleep are not. So the evolution of REM sleep is tied in some way to the evolution of dreaming. Several hypotheses about REM sleep see it as having a role in the consolidation of the day’s experiences, laying things down into memory. A series of famous experiments on rats (here and here) have shown that rats seem to replay their experiences of navigating through space when they sleep. The natural interpretation is that they are running back over earlier actions in a way that impresses them upon memory for later use. A different view that I have always found interesting was proposed nearly 30 years ago by Francis Crick (of DNA fame) and Graham Mitchison. They suggested that the function of dreams is to get rid of unwanted patterns of brain activity and connections. Dreaming is organized forgetting, emptying the trash, the unlearning of useless information. Watching dogs in REM sleep, it is hard not to think that they are experiencing dreams. They “yip” softly and move their paws as if running. As always, it is difficult to work out the connection between these observable phenomena and what all this might feel like to the animal itself. It is possible to insist that only in humans are these dream-like events accompanied by a subjective experience of dreaming. But why should nature produce a divide of this kind between the real and the faux dreamers? 1. Crick and Mitchison’s evidence included some animal data. They said that the Australian Echidna, or Spiny Anteater, is unusual in land mammals in not having REM sleep, and this animal has much larger cerebral hemispheres (the front part of the brain) than would seem necessary for its simple lifestyle. The Echidna needs a large brain, they suggested, because it gets cluttered, and can’t be cleaned out and re-set. Only if you can forget things can you get by with a compact brain. 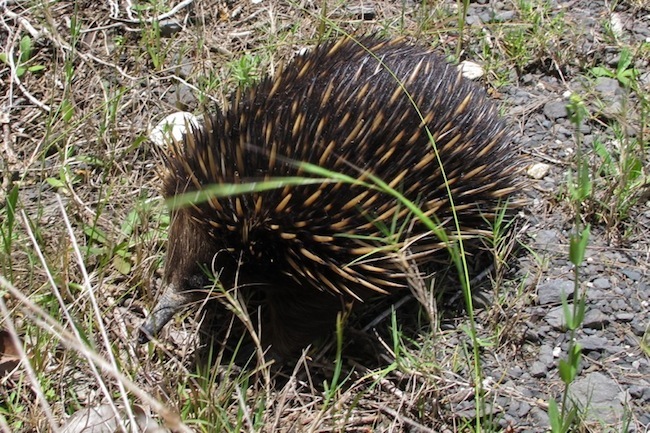 Some of the more recent papers I linked to above say that echidnas do have a form of REM sleep after all, but of an unusual kind that is confined to the brain stem. The Crick and Mitchison view also has to deal with dolphins, which may not have REM sleep either (though this seems to be unclear). Crick and Mitchison discuss dolphins in a follow-up. Here is another Crick paper. 2. The experience of dreaming: I said I could see no reason to think that dreams are experienced only by humans, and not by animals undergoing similar brain processes. Daniel Dennett argued in a paper from the 1970s that dreams might not really be experiences in humans either. What?? The alternative view, which he does not endorse but takes seriously as an option, is that dreams are just unusual memory traces that we encounter when waking.